Underfloor heating is a well-established heating option, but for anyone contemplating the system for the first time, Nu-Heat’s specialist team answers some of the questions that they have been asked. Q. What are the benefits of underfloor heating? A. Underfloor heating is a perfect heat emitter as it frees up wall and floor space giving greater room design freedom. Additionally, the quality of the comfort levels and low running costs are all good incentives. Warm water underfloor heating gives more comfortable warmth. It feels natural as it is similar to the way you are warmed by the sun. Where radiators heat the air by convection, drawing cold air across the floor and up to the ceiling, underfloor heating produces radiant warmth. 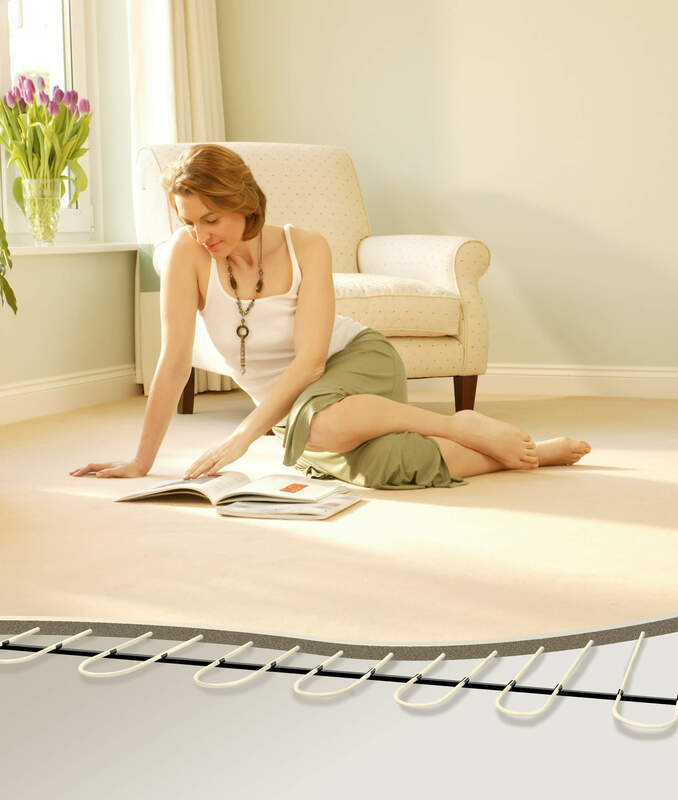 The entire floor is heated so warmth is released evenly – there are no cold spots, stuffiness or draughts. The gentle heat and low humidity creates a kinder environment for furniture and the circulation of dust and mites is reduced, making the air cleaner and less allergenic. Q. How do I know if my property is suitable? A. All new UK properties are built to strict guidelines on insulation and air tightness – key requirements for efficient underfloor heating. The system can be used in older properties as long as levels of insulation are enhanced as much as possible in line with current Building Regulations. Where this is not possible other upgrades, such as double-glazing, will help. In a listed building where such improvements are impractical, underfloor heating can still be installed but may require a higher flow temperature and closer tube spacing than in a well-insulated property. Nu-Heat provides specific information on the expected heat output of every system and give a clear indication of any areas that may experience a shortfall on the very coldest days. If we believe that the property is unsuitable for underfloor heating, we will always tell you so. Q. How easy is it to install? A. This depends on the person doing the installation! Underfloor heating is a reasonably straightforward procedure, although it takes a certain amount of concentration to get it right. Nu-Heat supplies clear, fully illustrated installation manuals and a supporting DVD to help. Free technical advice is available by telephone or email during office hours from experienced underfloor heating experts. Q. How do you design your underfloor heating systems to work with heat pumps? A. Underfloor heating is ideal to integrate with heat pumps because of the low flow temperatures used by both components. Underfloor heating is not the limiting factor in such a system. Once again the insulation level is crucial to design and, subsequently, performance. If insulation is sufficient, systems can be designed to the lowest temperatures, which can be less than 40°C. Nu-Heat uses specialist software that has been developed in-house to aid with the design process. Optimiser software establishes the most suitable floor heating scheme and determines the various technical requirements including correct tube spacing for each room and optimum water flow temperatures and Predictor software is used to correctly size heat pumps. Q. What is the best floor covering to use? The best options include stone, marble, ceramic tiles and polished screed. These all conduct heat well and present little barrier to warmth reaching the room. Thick flagstones will take a little longer to reach the right temperature, but the heat emitted will be the same as with thinner stone. Using carpet is feasible as long as the tog value (including the underlay) doesn’t exceed 2.5 and ideally is less than 1.5. Felt and rubber underlay may be less efficient than waffle-backed foam underlay. If timber flooring is used, it should be recommended for use with underfloor heating. Engineered boards are more stable than solid wood boards but the lower operating temperature of underfloor heating means that most solid timbers can be used successfully, although these must be well-seasoned or kiln dried. It is important to remember the ‘rug effect’! If you put a rug on a wooden floor laid over underfloor heating the trapped heat could spoil the wooden floor. Q. Can you install underfloor heating into stairs? A. There really is little point putting underfloor heating into stairs, unless you intend to spend a lot of time sitting on them! Nu-Heat did actually supply underfloor heating designed for stairs for one specialist who was building a cob house. The stairs were also built out of cob so the installation of underfloor heating was very practical. Normally there is no realistic benefit. Q. There is talk about using underfloor heating in walls, do you design for this? A. Wall heating is more commonly used on the continent. However, at the moment it isn’t prevalent in the UK. It may be something that becomes more popular in the future, particularly in retrofit situations. Q. Can my dogs still sleep on the floor if I install UFH? A. Nu-Heat is sure that the dogs will be very happy!